Soil erosion and settlement often cause concrete slabs in patios, sidewalks and driveways to sink into the ground. This type of settlement isn't just unsightly; it can also cause more damage and can be a safety hazard. Water tends to pool on sunken surfaces and unleveled floors cause a trip hazard.Until now, the only solution available to repair sinking slabs was mudjacking, a process that involves drilling holes in the slab to inject a mixture of cement and mud underneath, to raise it back to level.Foundation Supportworks, an industry leader in the development of foundation repair technologies and solutions, proudly introduces the most advanced alternative to mudjacking - the PolyLEVEL™ System.The PolyLEVEL™ System is a state-of-the-art approach to repairing sinking concrete slabs. It combines the concept of mudjacking with the most advanced technology. Instead of using a mix of mud and cement to raise the slab, PolyLEVEL™ utilizes high-density polyurethane specially engineered for this purpose.The advantages of using PolyLEVEL™ over conventional mudjacking are many. PolyLEVEL™ is lighter than mud-cement mixes (4lbs per cubic foot opposed to concrete's 120lbs). It will raise the slab without adding a lot of weight to it. The expanding nature of the material allows it to penetrate crevices in the soil, completely filling the cavity and safely raising the slab to the desired level.PolyLEVEL™ is also environmentally-friendly and made with recycled materials.It can be installed in just one day, through smaller, penny-sized holes drilled in the concrete and just 5 minutes after installation you can walk or drive over the slab!There is no need for extended periods of curing, as is the case with cement and mud compounds. Ashley Stansifer of Thrasher Basement Systems talks with Dave Washburn on Siouxland Business Spotlight about PolyLEVEL concrete leveling. Concrete can settle unevenly over time because of poor soil conditions beneath the concrete materials. 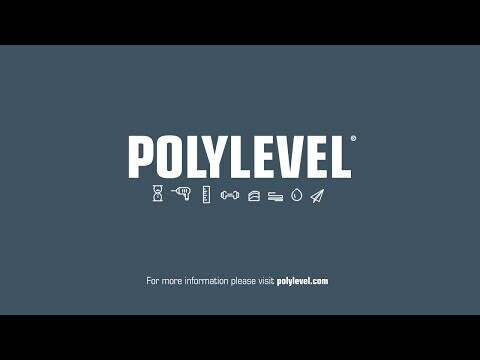 PolyLEVEL involves a minimally invasive process to inject polyurethane foam through small holes drilled in existing concrete to lift the concrete material and create a fresh level surface. While PolyLEVEL is a fairly new process, Thrasher Basement Systems have been experts in the foundation repair industry for more than 33 years and are well-equipped to handle any foundation issues -- big or small! 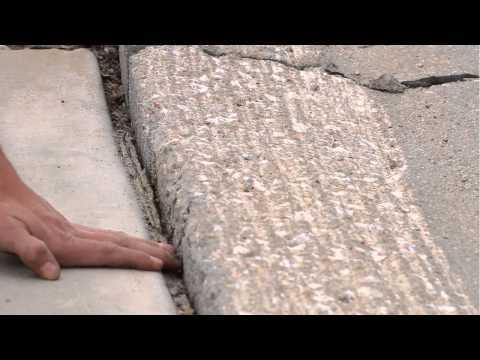 Soil erosion and settlement often cause concrete slabs in patios, sidewalks and driveways to sink into the ground. This type of settlement isn’t just unsightly; it can also cause more damage and can be a safety hazard. Water tends to pool on sunken surfaces and unleveled floors cause a trip hazard.Until now, the only solution available to repair sinking slabs was mudjacking, a process that involves drilling holes in the slab to inject a mixture of cement and mud underneath, to raise it back to level.Foundation Supportworks, an industry leader in the development of foundation repair technologies and solutions, proudly introduces the most advanced alternative to mudjacking - the PolyLEVEL™ System.The PolyLEVEL™ System is a state-of-the-art approach to repairing sinking concrete slabs. It combines the concept of mudjacking with the most advanced technology.Instead of using a mix of mud and cement to raise the slab, PolyLEVEL™ utilizes high-density polyurethane specially engineered for this purpose.The advantages of using PolyLEVEL™ over conventional mudjacking are many. PolyLEVEL™ is lighter than mud-cement mixes (4lbs per cubic yard opposed to concrete's 120lbs). It will raise the slab without adding a lot of weight to it.The expanding nature of the material allows it to penetrate crevices in the soil, completely filling the cavity and safely raising the slab to the desired level.PolyLEVEL™ is also environmentally-friendly and made with recycled materials.It can be installed in just one day, through smaller, penny-sized holes drilled in the concrete and just 5 minutes after installation you can walk or drive over the slab!There is no need for extended periods of curing, as is the case with cement and mud compounds.Thrasher Basement Systems is a foundation repair company serving Nebraska, Western Iowa and Northwestern Missouri with expert products and solutions you can trust. 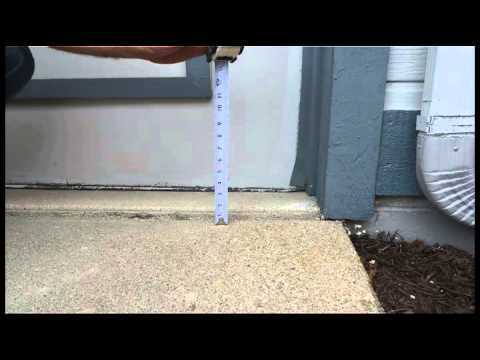 For more information about the PolyLEVEL™ System and how we can help level your sidewalk, garages, or concrete slabs, please call 1-814-250-5234 or contact us today!